It took four folio volumes to contain an illustrated Miroir historial. A manuscript now kept in Leiden and one in Paris form the first two volumes of such a set, ordered by the French royal family. In his Speculum historiale Vincentius of Beauvais describes the history of the world, from Creation until ca. 1250. With its 31 books and nearly 3800 chapters it functioned as a scientific reference work voor clerics and monks. But soon also translations were made available for a wealthy lay audience, first into Middle Dutch (Jacob van Maerlant began his Spiegel historiael in 1284). Around 1332 Jean de Vignay translated the work into French, at the request of Jeanne de Bourgogne, Queen of France. It took four folio volumes to contain an illustrated Miroir historial. A manuscript now kept in the Universiteitsbibliotheek Leiden as a part of the Vossius-collection (ms. VGG F 3 A), together with a manuscript from the Bibliothèque de l’Arsenal in Paris (ms. 5080), form the first two volumes of such a set, produced at a very early date (ca. 1332-1335) and luxuriously illuminated. They belonged to the the eldest son of Queen Jeanne before he assumed the French throne as Jean II (1350-1364). Both text and miniatures are of major importance to literary history and art history. The text contains corrections that possibly stem from the translator himself (they are absent in most redactions). The 730 (!) miniatures of the two volumes were not copied from existing models. They were planned and executed by a team of cooperating artists while their work on these manuscript progressed, quire by quire. That explains why the iconography stays remarkably close to the text. 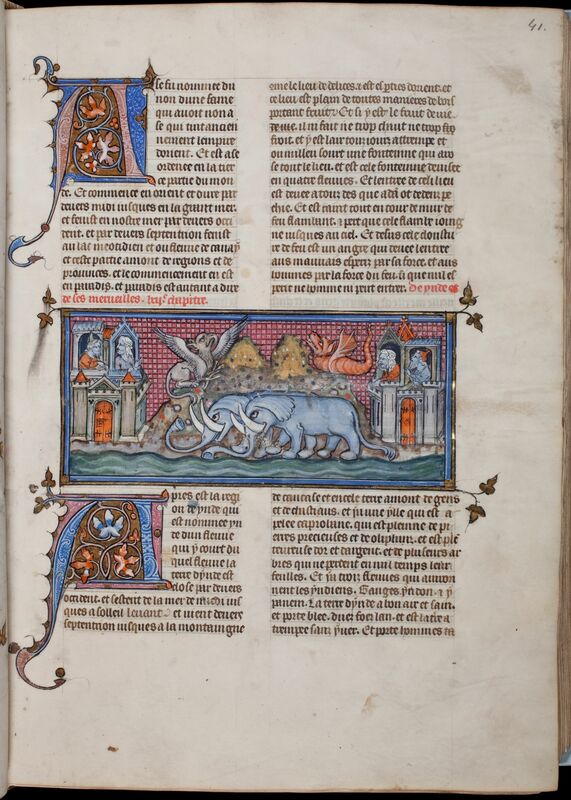 Many beautiful miniatures in the Leiden volume are painted by the Papeleu Master, for instance the one on page 41r, which shows the marvels of India: fabulous creatures (a griffin, a dragon, elephants) living in a golden mountain scenery, closely watched by exotic people with a blue skin. On 16 November 2010 the Getty Center in Los Angeles opened its exhibition 'Imagining the Past in France, 1250-1500'. There the two royal manuscripts lie side by side, in a special showcase, united for the first time in 500 years ... For the occasion of this ‘reunion’ the Leiden volume has been digitised and made available in Leiden's Digital collections. The Bibliothèque de l’Arsenal will do the same for the other volume.